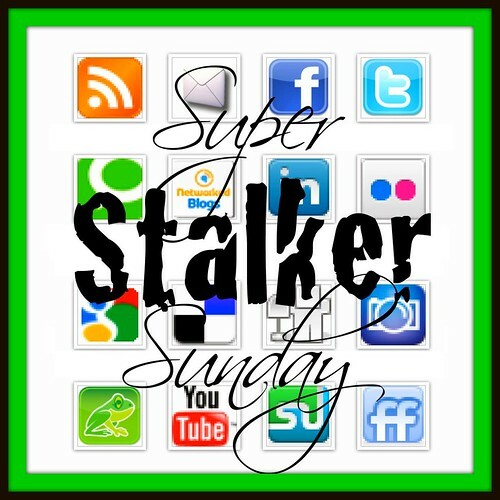 DnBuster's Place: super stalker sunday~ I am this weeks featured Blogger! super stalker sunday~ I am this weeks featured Blogger! Blogs hops are a great way to meet other bloggers,socialize and gain more followers. Do you like to socialize? Well, we all like followers,right?! After you follow the hosts, follow as many bloggers in as many ways as you are willing! If you already follow someone, considering visiting their blog and follow them in another way! Remember: You will only get as much as you give. The more blogs you can visit, the more visits you will gain in return. While we encourage sharing our button and hop with as many as possible, it is not required. The more you spread the word though,the more we socialize and all gain followers! -What’s your favorite way to stalk a blog? My favorite way to stalk a blog is to follow the blog via google freind connect, twitter and facebook so that I dont miss any of their posts. -You have an extra hour added to your day, what would you do with it? Being that I live in Texas and its been above 100 degrees for days, I would spend it floating in the pool. Is there a TV show that you have watched every episode? I recently got cable TV so I have been VODing Toddlers and Tiaras, Dog The bounty hunter, Touched by an Angel and CSI Miami. -What book is currently on your nightstand? At this time I am reading The Medium Next door by Maureen Hancock. -Pick a post, any post. I like to share that there is an income to be made online ~ I posted about the sites you can earn a few dollars a month at. In June 2011 I had my best month EVER earning online. I earned almost $1,000! This linky will go live Saturday at 7:00 PM PST and end Monday at 12:00 PM PST. I'm now following your blog from Super Stalker Sunday! I would love for you to stop by and say hi! I'm a new follower from the hop! Hope to see you stop by ParentPalace sometime. Happy Sunday! Hey hun! Thanks for stopping by and following. I am one of your followers as well. Hi! New follower and here for the hop! Please stop by http://aboutamom.com to say hi & return follow! Hi! I am a new follower from Super Stalker Sunday. I am now following you via GFC, networked blogs, and I joined your community on Blog Frog. Congrats on being this week's featured blogger! Congrats on being this week's featured blogger. I'm a new follower. Congrats on being the featured blogger!! I am a first time Super Stalker and a new GFC follower of yours. I look forward to reading your posts. Here from Super Stalker Sunday! Your post below about earning $ online is really interesting. I may just give it a try.